School garden safety is crucial! Be sure to review the California Department of Education School Garden Safety guide before beginning your project as well as UC Cooperative Extension's Common Ground Garden Program website. 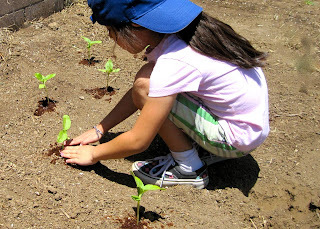 Here's a quick run through of steps you'll want to take prior to establishing a healthy and safe school garden environment (the guides above go into further detail). Remember, a school garden is not a sole person's responsibility, it takes a group of committed individuals and leaders to support such a great effort. It's essential to distinguish a garden support team. This team can be comprised of teachers, afterschool leaders, students, parents, older siblings, and college interns. The list is endless of who can support school garden efforts, it's all about the approach. 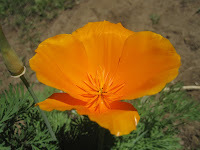 Don't forget to reach out to your local county master gardener. Soil Preparation is key. Soil can be contaminated with chemicals such as arsenic and lead, even bagged soil sold at garden stores can contain unknown heavy metals and chemicals. Heavy metals reside within the topsoil. Contact your local master gardener to find a healthy source of soil or to guide you in testing your own soil. Be weary of donations from soil companies. Click here for a story on a soil company's school garden donation and why I warn everyone to be cautious about their supplier. Organic soil amendments (anything added to your garden soil). 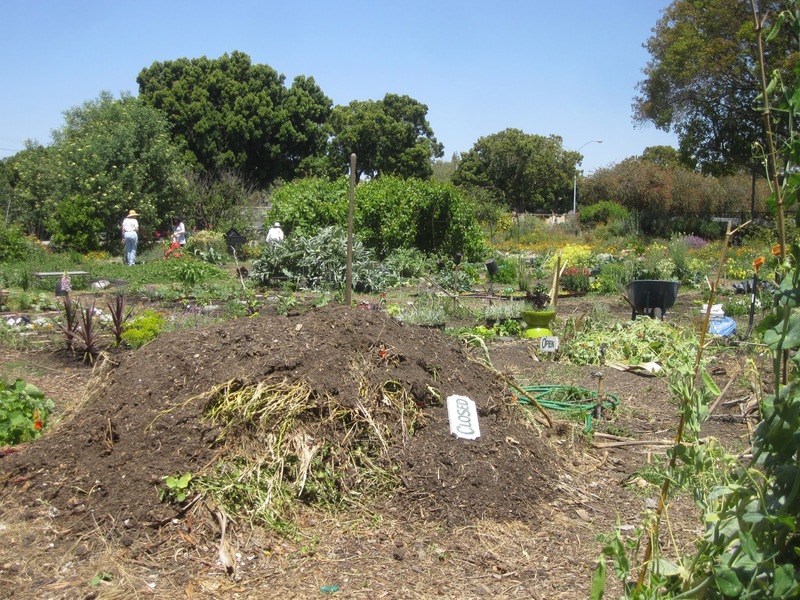 Every school garden should establish a composting system that will organically support the creation of healthy soil. Healthy productive gardens have healthy soil with lots of worm activity. A book entitled, "Kids Can Compost" by Wen-Chia Tsai Parker is a great resource to get students composting. Beneath the sheet mulch. Life! Mulch. What will cover your garden's ground? 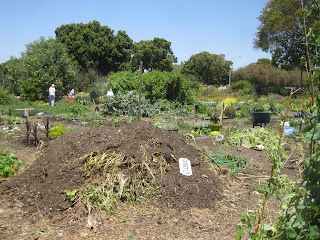 Mulch is a great resource in maintaining soil moisture and discouraging weeds. A great economical way to mulch your garden is by way of sheet mulching. If you get mulch donated from a local tree service make sure it's from untreated trees and that the mulch is chopped up well. Large sticks can pose as a safety issue in and around the garden. Be sure to remove them prior to garden activity. Straw is a great option for mulch! Building materials. 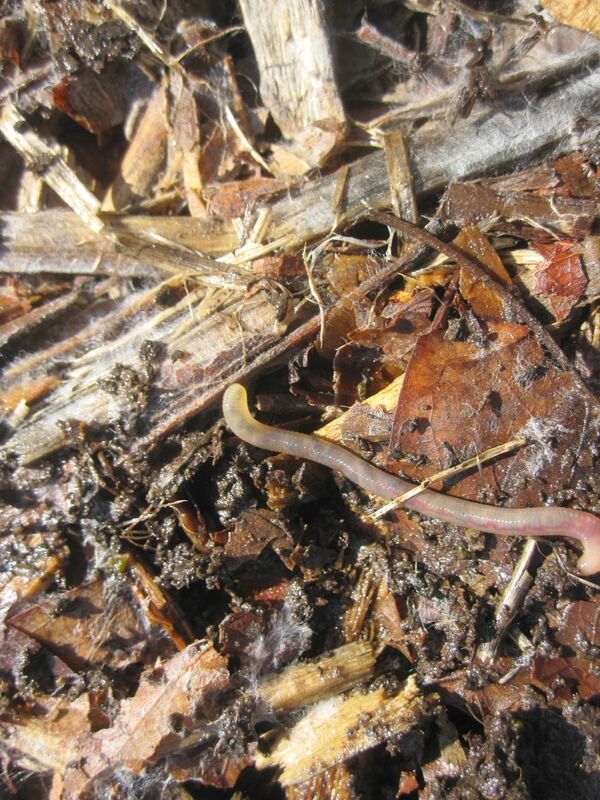 Untreated wood should be used for raised beds, treated wood contains cyanide. Stay away from railroad ties, they look perfect for the job, but they are filled with creosote (a carcinogen). These toxic chemicals can leak into the garden soil. Think of safety first when choosing building materials. If you plan on creating raised beds ensure they are no wider that 4ft. You want to ensure that smaller arms can harvest all that they sow. Water. 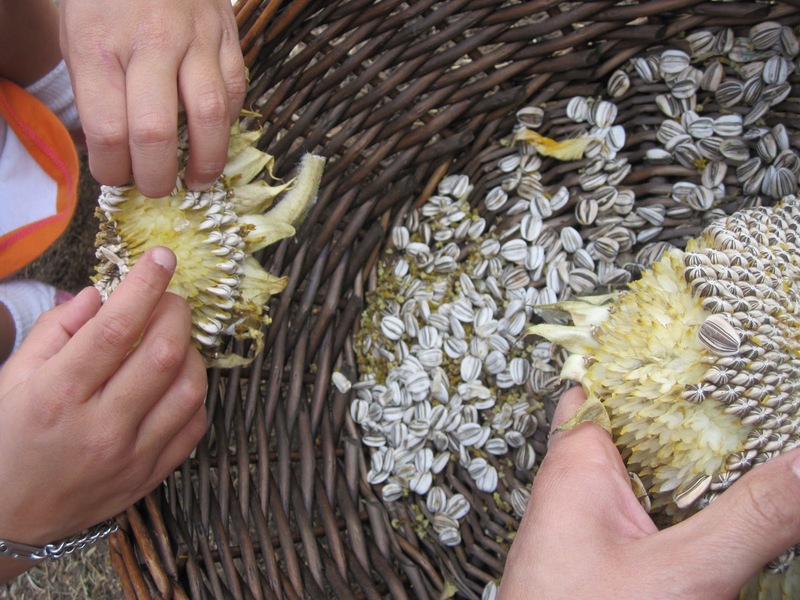 When selecting a school garden location think about how you're garden team will water the garden. Some sites like timed irrigation but that creates a distance between you and your plants (unless you plan on developing a farm model). Watering by hand allows students to have a closer relationship to what they are growing. Have older students research different ways of watering, such as creating berms and/or swales. Be sure to have watering cans that are easy for students to use. Be creative with garden rotation teams, perhaps there can be a "watering team" and a "seed starter team". Salvia clevelandii, native to So Cal. Biodiversity. 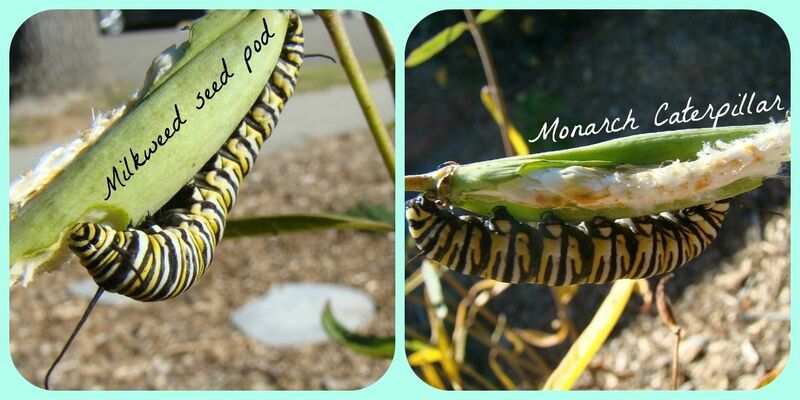 When you're creating a school garden, you're really creating an ecosystem. 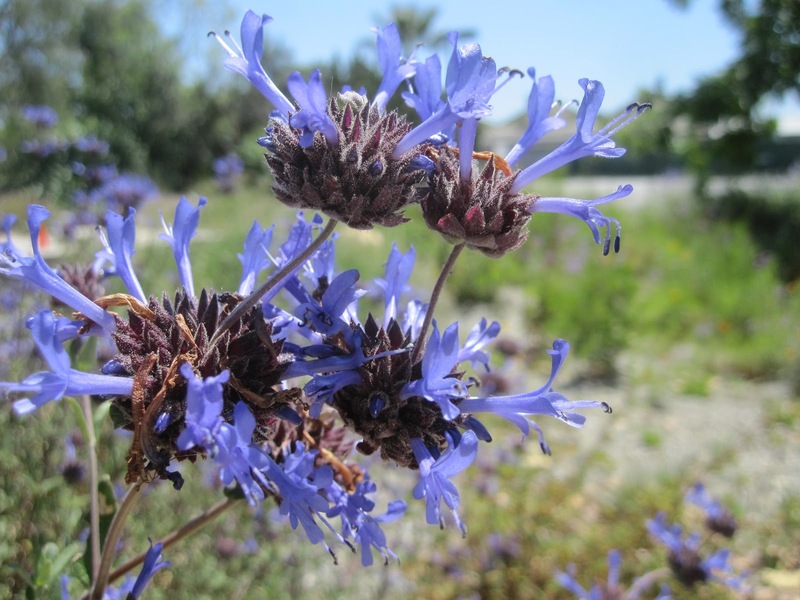 A school garden should incorporate local native plants and other varieties that invite beneficial insects. School Garden Agreements. Before entering the school garden all students should review school garden safety agreements. With the support of a garden leader students should establish their own school garden agreements. Focus on keeping it simple so the agreements are easy to review. 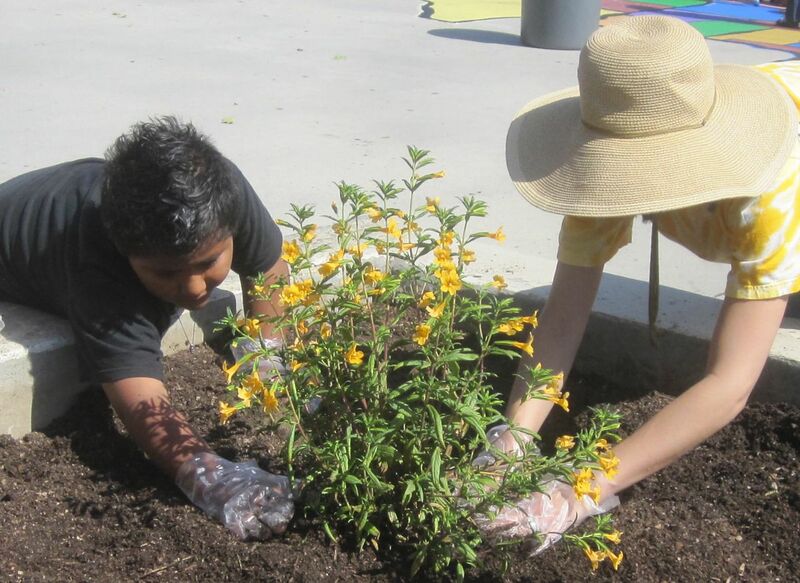 Planting monkey flower with student volunteer. Donations. People will be excited about your project and may want to donate some resources. To ensure you are meeting all the safety guidelines it's best to provide a list of items needed prior to your garden build to have available for interested donors. Here is another great safety guideline from the USDA for school gardens, I especially like page 5 which reviews school garden donations. School Garden Heroes. We all need role models. Here are some links to school garden super heroes, take notes. Transplanting sunflower seedling from seed sown by her.